Newton's Nook Designs: Holiday Release Winners + Sale! Holiday Release Winners + Sale! Scroll down to see if you won - then head over to our store to go shopping at newtonsnookdesigns.com. Congrats to the Winners! Don't forget - you have 7 days to e-mail us at info@newtonsnookdesigns.com with your full name and shipping address to claim your prize. Follow along for more inspiration! Don't forget to like us on Facebook and follow us on Pinterest for more inspiration every day! Congrats to the lucky winners! So sorry I missed the last day of the hop! Congrats everyone! 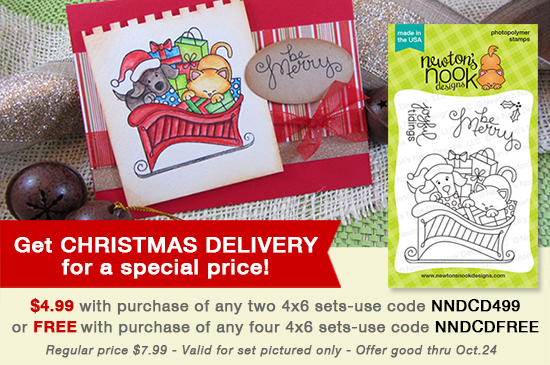 Have fun with your CUTE Newton's Nook goodies. I'm so excited to be a winner, though the email as you gave it, info@newtonsnookdesign.com, didn't work, so I added an s to "design" and sent it again. So I hope you got my info! hmmm, my email got returned also, so I tried adding the 's' as suggested by Dianne in the comment above! Hope it worked! Oops! Sorry for the typo above! I've fixed it now! So excited to be a winner! I absolutely love that Holiday Hounds set. Off to email you! Happy Halloween! Two Be-witching Kitty Cards! Two Kitty Christmas Cards on Kraft! Halloween Treat Holders with Larissa Heskett! Halloween Kitty Card by Tessa Wise! One Layer Fright Night Halloween Card! October Guest Designer - Heather Hoffman!